Secluded Cottage on Stella Lake.Row Boat, Bedding, Cookware. This secluded cottage is perfect for guests seeking private vacation time. Situated on the north end of Stella Lake you will enjoy the entire use of the lake. The lakes length and width make it perfect for an All Sports Lake. You will enjoy a nature's view of state forest lake front, with many wildlife sightings. You will enjoy the rustic setting and cottage as your central destination for all activities. You will be in the National Hiawatha Forest for a vacation stay of your choosing. Much to discover! 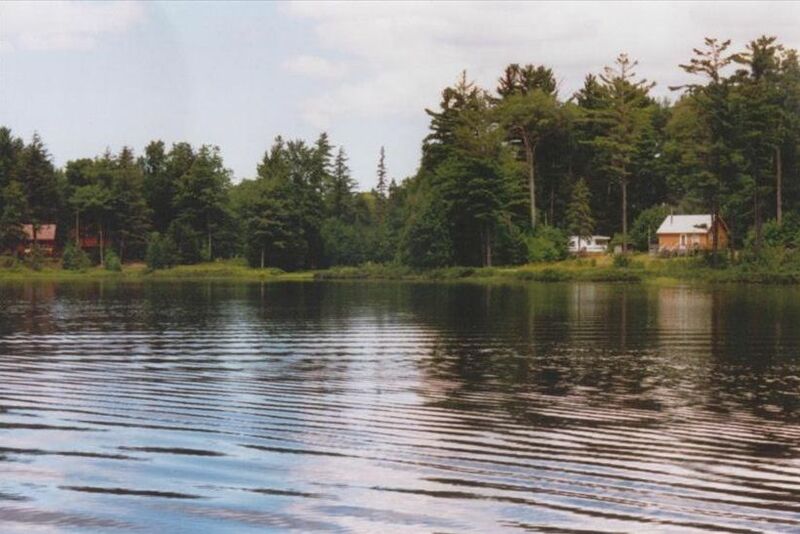 Keywords: Secluded Lakefront Cottage on Beautiful North end of Stella Lake. Great Fishing of Walleye, Pike, Bass, Panfish. Row Boat, Bedding, Cookware included. There is a full cook area without oven. Cook top only. We had a terrific time on Lake Stella! The sunsets were beautiful from the dock and the stars were amazing viewed from the fire pit area. We took the rowboat out and swam in the lake. Frogs, toads, squirrels, and chipmunks abounded. The sleeping loft was comfortable with the air conditioner and fans and the sitting and eating areas were ample. We especially loved driving the 2.5 mile dirt/sand road to get to the cabin gate. The seclusion was just what we were looking for. The Hiawatha National Forest surrounds the lake and area, but we were easily able to access the charms of Grand Marais, Munising, and Marquette and enjoy the Pictured Rocks National Lakeshore. We hiked to several waterfalls, but there was so much to do we will have to come back again to complete all the hikes and activities that were on our list! Just returned from our family vacation and already planning our trip next year! The photos and description of this place do it absolutely no justice. The cottage is cute, comfortable and clean. The fishing was great! I loved waking up in the morning with my coffee, sitting on the deck overlooking the lake - so peaceful and quiet - and spending nights by the fire pit. Pat and Myra were very welcoming and helpful. I feel very lucky to have found such a great place, and hope to be able to stay again next year. We are thrilled you had a great time, and are looking forward to seeing you again soon! Okay, first of all, if you are expecting to stay in a luxurious or a very convenient place close to shopping places and restaurants etc. please stay away, not only from this cottage but from Upper Peninsula all together. UP is a secluded, nature's lap and there you don't expect to find in Four Seasons or Mariotts. This cottage is located few miles from the main area of Munising but it is a very awesome place. It has everything you need, cookware, linen, basic TV, DVD player with many movies, however I won't be expecting you to do watch TV. On the back, there is a beautiful lake, a fire pit, a row boat. What else do you want in adventurous seclusive location ? Take your basic groceries, alcohol and clothes, bug spray and camping stuff and you are all set. This place is good if you are into fishing (which we were not), however, wake up, make good breakfast (eggs) and then head off to Munising, hike and kayak and come back, enjoy the firepit and have couple of beers and fun with friends. This is exactly what we did when four of us visited this place (all of different ethnic backgrounds). I would give it a 4.25 star rating but I want to give it 5 because other reviewer screwed the ratings of this place. Also the owners are very nice people and their friends, who own a store about 5-6 miles away (Pat and Myra) are super super nice people. I just loved the warmth that I had when I was dealing with them. So make sure what you expect before you even travel Up North..... the nature's retreat. We are very pleased you had a great time. Pat and Myra are wonderful people and have so many items, at their store, that guests may need during their stay. The reason guests love this cottage is the seclusion. There are no brighter stars in the sky, than here, most nights! Thank you for your very nice review! This was an absolutely quaint, clean place! Don't let the one bad review scare you off. It is totally represented accurately in both pictures and words. If you are looking for an escape at a reasonable price, this is it.The fishing is awesome. It is close to a lot of trails and Munising attractions. The brand new deluxe grill on the large deck with new patio furniture was a plus. I would come back. I believe the one bad reviewer was looking for a hotel style stay. I knew it was a cottage and we found our stay here delightful. Don't forget your fishing poles (they provide a nice row boat and lake frontage). Oh, and next time I will definitely bring a hummingbird feeder because they were buzzing around too. Enjoy! Thank you for your review. We are very pleased you enjoyed your stay. The peaceful alone time is exactly what repeat visitors crave from the location of this cottage. Visiting the Secluded Cottage on Stella Lake, is your vacation of options. Sitting on the porch Eagle watching, fishing, or walking the many miles of logging roads, is just some of the options. Kids love being in the "wilderness", while Mom's love "warm showers"! It's like camping with better comforts! The worst place I've ever stayed...checked out after one night. Run don't walk from this falling down dump! Ratty, old, run down. Steep stairyway without a railing to a tiny "head bumping" loft space. Pump to well is in the kitchen and groans loudly every time the water is used, including flushing the toilet. Wouldn't recommend this place to my worst enemy. Screens were out of the doors and mosqitos were inside everywhere. Our property is rented and re-rented by many guests who love staying here. The beauty of this property is the secluded, rustic setting, and natural beauty of the lake, and is exactly as represented by the listing. It is in the middle of the National Hiawatha Forest. Guests who return to our property are looking for the purpose of being in the woods. This Guest rented during the hottest week in July. He called a week after his rental period, complaining it was too hot. Had he called immediately, we had two couples who desperately wanted the cottage during this exact time period. He NEVER contacted us, or the property manager, that it was too hot for his comfort until a week later, then wanted a refund. Had he contacted us, we could have easily filled his week and would have gladly made arrangements with him. Screens and condition of the cottage were immediately checked and were in perfect condition. There is a hand railing leading to the loft. As stated in our listing, there is no air-conditioning. This guest is accustom to 24/7 air-conditioning in his home state of Arizona, not rugged summers in Michigan. Many options to discover depending on your interests. This is for a 7-day rental (Saturday-Saturday).